There’s no doubt that the High Line‘s success pushed urban renewal to the forefront and made its mark on public awareness. In our fourth installment of case studies related to our program’s field of research and practice, we’ve decided to highlight similar projects involving infrastructural renewal that are perhaps less known but just as significant to the practice of urban planning over the years. 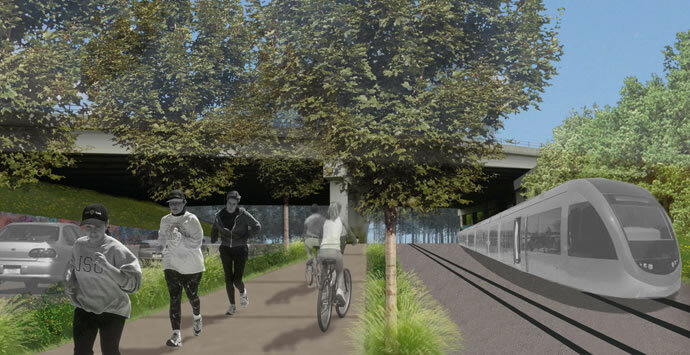 Here is our roundup of infrastructure regeneration projects, which focuses on the transformation of large infrastructure such as highways or railroads into public parks, transit systems and civic spaces. 1. Embarcadero San Francisco, CA, USA – It was the irreparable damage from the 1989 Loma Prieta earthquake that finally forced the Embarcadero Freeway to demolition, and in 2002 it was replaced by a dynamic multi-use boulevard designed by ROMA Design Group that gave rise to a new public plaza and waterfront promenade. 2. 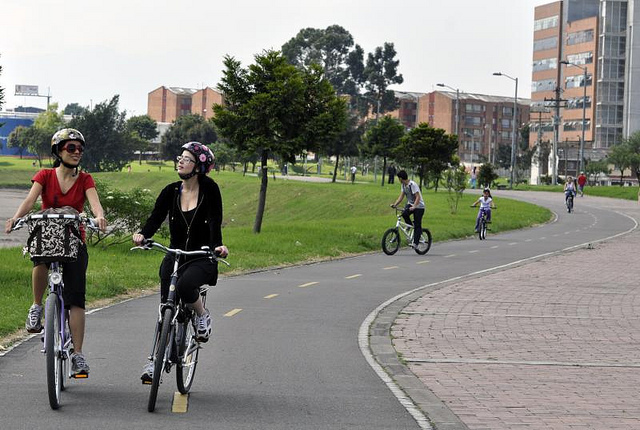 Juan Amarillo Greenway, Bogotá, Colombia – During the 1990’s plans to build an elevated highway called the Inner Ring Expressway were scrapped in favor of Penalosa’s 45-kilometer greenway that now connects low-income neighborhoods to the downtown, and includes a mass-transit system that revolutionized bus rapid transit and carries 1.8 million people, and over 300 kilometers of bike lanes. 3. Downtown Milwaukee, WI, USA – Due to public protest for its disruption of the local street grid, the Park East Freeway which started construction in 1971 was soon halted and only in 2003, was replaced by a surface boulevard that reconnected the street grid and stimulated new neighborhoods like East Pointe along with a community of shops and residential developments. Left: The underused Park East Freeway, via. Right: Demolition of the freeway, via. 4. Tom McCall Waterfront Park, Portland, OR, USA – Considered the first major highway to be intentionally removed, Habor Drive was built in 1950 and with the then-governor’s support was converted in 1978 into a 37-acre waterfront park that led the way for broader urban redevelopment and more compact and pedestrian-friendly developments. Left: Postcard of Harbor Drive, via. Right: Waterfront park, via. 5. Cheonggyecheon Restoration project, Seoul, South Korea – In the late 1970’s a four-lane elevated highway was built atop the Cheonggyecheon creek near downtown Seoul which once served as drainage for the city until the 40’s. After safety concerns and much debate, the expressway was turned into a pedestrian park in 2005 that reclaimed the river, decreased the number of cars in the area and increased the use of public transit. 6. Klyde Warren Park, Dallas, TX, USA – Completed this fall, the development of the Klyde Warren Park begun in 2009 has created an urban green space over the Woodall Rodgers Freeway with the aim of providing connectivity to the city’s flourishing Arts District. 7. Atlanta Beltline, GA, USA – This ambitious urban renewal project boasts a 35km public transit, trails, and parks loop around the heart of the city on the site of an abandoned rail and industrial corridor, connecting more than 40 diverse neighborhoods, city schools, historic and cultural sites, shopping districts and public parks. The project aims to improve transportation and add green space and promote redevelopment. 8. 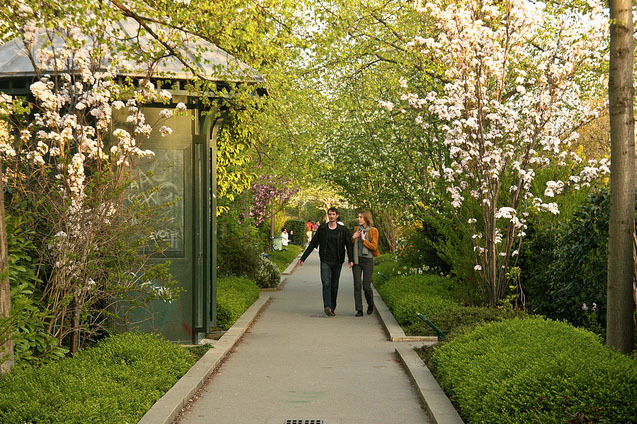 Promenade Plantée, Paris, France – A model for the High Line as the first elevated park in the world, this green promenade in Paris designed by landscape architect Jacques Vergely and architect Philippe Mathieux was constructed in 1994-2000 atop an abandoned 19th century railway viaduct that runs from the Bastille Opera to the eastern city limits and which now harbors the Viaduc des Arts. 9. 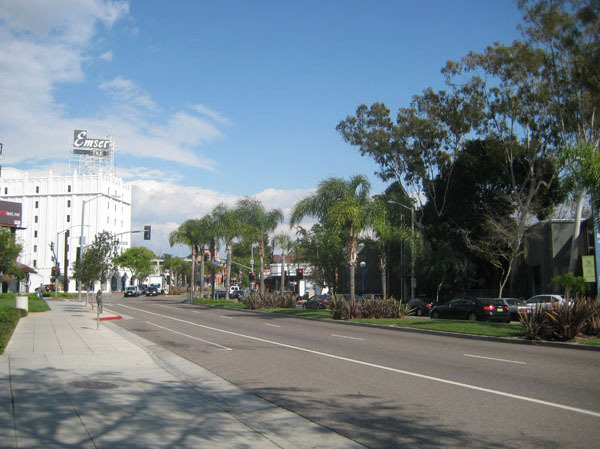 Santa Monica Boulevard Master Plan, CA, USA – There was a time, not too long ago, where “you took your life in your hands just to cross Santa Monica Boulevard,” said Jeff Prang, a member of the West Hollywood City Council. The redesign of the boulevard–part of the historic Route 66– that started in 1997 resulted in a complete street, a multi-modal thoroughfare with thriving businesses, affordable and green housing developments, civic spaces, and public art. 10. 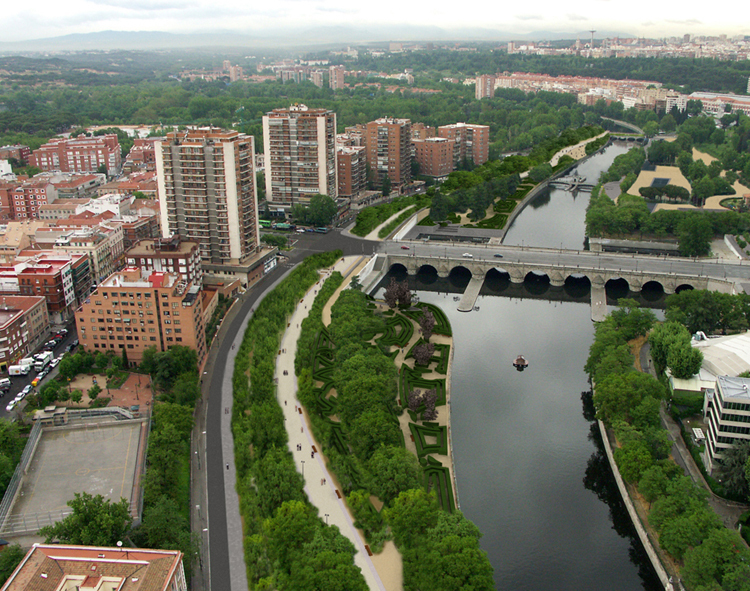 Madrid Rio, Spain – The recently completed 8km long park in Madrid reclaims the Manzanares riverfront and reconnects neighborhoods that the M-30 ring road highway had cut off from the city center and which cost $4.5 billion to bury underground. Equipped with green spaces, footbridges, bike routes, pedestrian lanes, wading pools for toddlers and a public plaza, the development has been criticized for its high costs and more recently for conflicting speed limits for cyclists, lack of public toilets and eroded landscaping, though in general the park is a welcome sight for neighbors who not long ago had to put with a noisy eyesore. If you’d like to add any, please do so in the comments! Can I just say what a relief to find a person that genuinely knows what they’re discussing on the web. You certainly know how to bring an issue to light and make it important. A lot more people have to check this out and understand this side of your story. I was surprised you are not more popular because you surely possess the gift.